We have owned Turkel since May 11, 2014. When we bought Turkel, we were not looking for an Ultra Van, an RV, not anything at all, even another car. 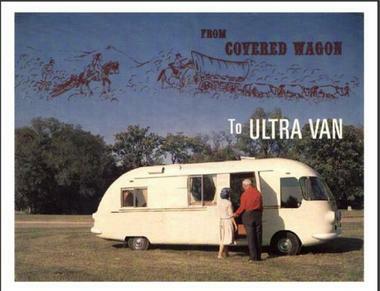 We really didn’t know much about an Ultra Van. We had seen a couple at Corvair events. Molly often searches for car-related items for other people. During one of these searches on Craigslist she found this ad for an Ultra Van, it was only located about 60 miles away. For some unknown reason, probably curiosity, she sent an email to the seller for more information. The seller responded the next morning. About the same time, people on the Corvair forums started commenting on the ad; they might go look at it on a weekend, etc. When Ken Hand commented that if he has not just bought an Ultra Van, he would be interested, I told Chris (I was at work) to take deposit money from the bank and go look at it. A few hours later we owned an Ultra Van. The previous owner had owned it for a few years, but since he had a stroke, it had been sitting except for occasionally taking it out around the block to keep it in running condition. This allowed Chris to drive it home since it was only about an hour’s drive. This owner had purchased it from a friend who lived down the street. He had used it to stay in when his job sent him to Memphis, TN for a few years. Then prior to him, #328 was owned by Morris and Tennie Randall. They sold it around year 2000. They owned it for a very long time and drove it a lot. We have the 100,000-mile plaque to substantiate this. This coach was taken care of over the years. The paint job is over 35 years and still looks good. The interior, most likely redecorated by Tennie Randall since she was a decorator, was only a little dusty. The interior is somewhat different from the original interiors. It still has the same galley, except for the curtain, which coordinates with the other curtains. At some point in time, a shorter than factory gaucho with drawer storage underneath was put when there would either be a gaucho or the bookcase/table combination. The heater had been removed and paneling and the aluminum outside have all been replaced. In that corner is a curved-edge shelf that held a small TV when we bought it. There is still the large crank-up antenna on the roof. There was still analog TV the last time this coach was used. Since we don’t watch TV when staying in Turkel, we have replaced the TV with an original lava lamp. The cockpit modifications include redesigning the wheel wells to come up vertically from the base. This makes more room to get in and out up front and works well with the bucket seats mounted on swivel bases. Chris thinks the seats are from a Mazda. We did get the original seat frames and cushions with the purchase. Right now, we’ll stay with the buckets. Since there is a gaucho in place of the bookcase/table, there is a table with a folding leg designed to catch the edge of the coffee bar and set up between the seats. Since the seats are on swivel bases, it's easy to turn and eat at the table. The bedroom area also has lots of modifications. Some go with the fact that the hatch modification was added at some time. This includes a storage area under a shelf-like headboard across the back. Since this eliminated the normal back engine access. The bed is a full-width extra long mattress on a platform running side to side, which lifts to give access to the engine. The mattress is upholstered with flowered material and a ruffle that makes it appear as a perfectly made up bed. This is so handy for all those show-and-tell times. Just pull off the bedclothes, fold them and store them away and voila, a perfect-looking bedroom. Along with the hatch modification, the coach has a screen door and exterior door with large stationary window, the front has floor-level vents that allow some air circulation in the cockpit. All windows, except the windshield and driver and passenger windows have been replaced with Lexan. Unfortunately, after this many years, they are quite cloudy. Turkel has A/C. Right now, new since the previous unit quit cooling a year or so ago. Whether it came from the factory with AC originally, no one knows. Chris has done some non-visible things to keep it on the road. The biggest was two rebuilt heads (thanks, Ken Hand) since we had two dropped valve seats, both at the same time on the way back from the CORSA convention in Springfield, IL. As of the end of 2017, 3 1/2 years of ownership, we've put around 15,000 miles on Turkel. Hopefuilly, more from now on since both Chris and Molly are retired. Nice to hear the backstory on these coaches. Always seems to be the same Great to have met both of you at the rally this September!